Our dance studio wp theme is designed for visually impressive websites, with large sliders and images, stunning carousels and generous footers. We’ve tailored the theme to a dance academy needs, so you will find custom functionalities such as dance timetables, that will help you build a gorgeous website in no-time. Good for ballet classes or other types of dance studios. Pirouette improves standard WP options with an extended Customizer that allows you to tweak everything to your needs. 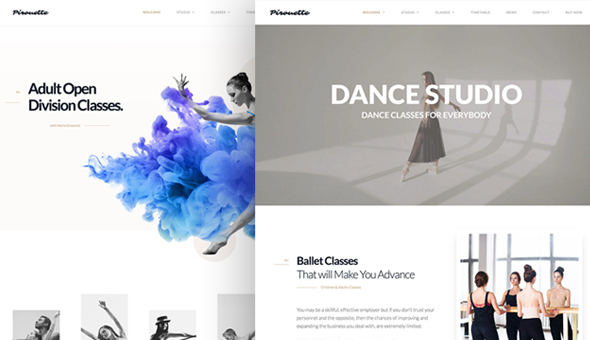 Pirouette WP Theme perfectly suits any ballet class, dance school, dance academy or dancing studio. We always keep themes updated. Our products are in great shape even after several years and we love to hear clients’ feedback, so we can add new features. Pirouette includes an easy auto-update function, so you know you are running the latest version.